Your mouth is an incredible part of your body, working with precision to help you eat and speak. Like a machine, they are designed to work with all parts intact—that includes each and every one of your teeth. Missing teeth can cause a myriad of problems, from gum disease to speech problems to “sinking” in your face (your back teeth support your cheeks and lips; losing them can stress your facial muscles and cause them to droop). For your mouth to function effectively, missing teeth should be replaced as quickly as possible. 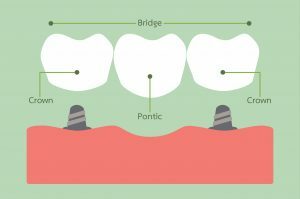 A bridge is a method of “filling the gap” where a missing tooth once was. Bridges made of varying materials (often porcelain fused to metal) are molded to fit where the tooth is absent. The bridge is attached to restore full functionality and appearance to the patient. There are two types of bridges available: fixed (also known as fixed partial denture) and removable. As the name implies, fixed bridges are permanently attached to the abutment (adjacent) teeth and can only be removed by your dentist. Crowns can be placed on the abutment teeth, or artificial teeth can be bonded directly to the abutment teeth for fixed bridge work. Removable bridges are attached using small clasps or precision attachments. These bridges can be removed and cleaned. Fixed bridges offer much more stability and strength than removable and can be brushed as usual. The importance of filling in for missing teeth is very high. Stress on your remaining teeth, gums, and soft tissues can cause extreme discomfort and even disease. Missing teeth can make chewing and eating extremely difficult, and you may not be able to chew your food enough for good digestion. Many patients with absent teeth also develop speech problems and do not enunciate properly. And for many, the appearance of a full set of teeth is important for their appearance and confidence. With today’s advances in dental work, we can ensure that your bridges are effective and attractive.